Fellowship Previews: High School is Hell for EMPOWERED! High School is Hell for EMPOWERED! Empowered's "frenemy" Sistah Spooky was once a schoolgirl who sold her soul for hotness, but was granted even more magic than beauty. 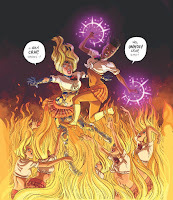 Now, both superheroines find themselves trapped in a high-school hellscape by Spooky's Infernal Service Provider—with her blonde ex-classmates plotting ritual murder to claim her magic for themselves! Eisner and Ignatz award-winning artist Carla Speed McNeil, acclaimed creator of Finder and artist of No Mercy, Queen and Country, and more joins Empowered creator and writer Adam Warren for the first Empoweredcomic-book miniseries in standard comics format. Empowered & Sistah Spooky’s High School Hell #1 is on sale December 20, 2017 and is available for preorder at your local comic shop.